Hello! There are two things that are very popular and very much in demand in the arts and crafts world today and that is burlap and chalkboard paint. I don't know how many times a day at my job at a fabric and crafts store where I have to direct a customer to the chalkboard paint or answer the question 'yes, we sell burlap'. Now, I'm not too crazy about the burlap faze, too rustic and country for my refined taste (ha-ha), but I do love chalkboard paint. Have any of you seen the idea where they are spray painting the tops of canning lids with chalkboard paint and then writing the contents of the jar on the lid? That is so cool! Well, the chalkboard faze has made it to the paper crafting industry now, and I've fallen in love with 'chalkboard cards'. The traditional way is to use black paper and white ink, stamping the image twice to get a 'blurred' look and then sponging more white ink on the paper to make it appear like a messy chalkboard. Love the look, but too much work for a CAS designer like me! So when Daydream Designs came out with digital sets of Chalkboard Art, I was thrilled. No messy, inky fingers for me. Just print and go! Here is my very first Chalkboard Card. I used an image from the set 'Chalkboard Love and Sunshine Digi Set'. I know you must think I printed it on black paper, but I did not. It's printed on white paper. The sketch is from Splitcoaststampers (SC396). I used card stock the colors of the sentiment, and I embossed the teal blue panel with a Cuttlebug Embossing Folder. Adhesive gems, ric rac, and a crocheted flower from Martha Stewart were added for embellishment. Hello and welcome to another Digital Tuesday Challenge. This week's challenge is hosted by "ME!" and I picked the theme 'Winter Wonderland'. That's a pretty interesting choice since anyone who knows me knows I hate winter; BUT, it can be pretty even though it's physically uncomfortable. LOL! So that is what we are honoring this week...the beauty of winter! Simply make a card or project with a winter theme, and be sure to include at least one digital element. Our sponsor this week is MyGrafico and they are giving away one digi set from their store to one lucky randomly chosen winner. To make my card, I used a penguin image from the Pixel Paper Prints set 'Penguin Digital Stamps', which is sold at MyGrafico. My sketch is from TCPTUES230, and the paper is DCWV 'Winter Matstack'. The sentiment stamp and the blue felt snowflakes I found in the dollar bins at JoAnn's Fabrics and Crafts. I printed the penguin, cut him out, and popped him up on dimensionals. I put a white pom pom on top of his hat. Hello! Today I have my January Christmas Cards to show you. As most of you already know, I play the Splitcoaststampers Christmas Challenge where we make Christmas Cards all year long so we don't have to make any during the busy Christmas Season. I make four cards a month so that I'll have about 50 at the end of the year. This month, all my Christmas Cards were made with images from the Flourish set 'Season of Celebration'. I already posted one of the cards HERE that I did for Digital Tuesday Challenge. Here's the second card I made. My layout is Mojo Monday (276). The snowflakes are pre-cut felt pieces from JoAnn's Fabrics and Crafts. The paper is Basic Grey. Because I'm fairly inexperienced with Silhouette Images and struggle a tad with them, I decided to case two of my favorite Flourish's card that use this set. The first one I cased from one of my favorite stampers Dawn Burnworth. You can see the card I cased HERE. I changed the paper, and added a charm, but that's about it. Why mess with perfection? And this card I cased from the fabulous Silke Ledlow! You can see her original card HERE. I did the same layout except I didn't have a pretty button or big flower like Silke's to use. Hello and welcome to the Digital Tuesday Challenge. This week's challenge is to use your Favorite Color Combo on your card or project, and be sure to include at least one digital element. Our sponsor this week is Template Dreams. To make my card I first looked at my 'Color Throwdown' Favorite Color Combos I had been saving in my files. Since I really don't have a favorite color combo and I'm currently working on my January Christmas Cards for 2013, I chose a pretty color combo for Christmas Cards from CTD221 to use. 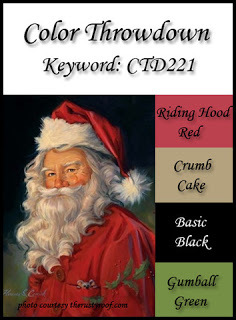 And here's the card I made using these colors. My outside image and sentiment are from Flourishes. I did the Crumb Cake background using a Cuttlebug Embossing Folder. The ribbon and bells are from JoAnn's Fabrics and Crafts. The banner dies are from MFT and the the other shapes are from Spellbinder's Nestabilities. And if your wondering where my digital element is, it's on the INSIDE of the card. The digital sentiment is from Daydream Designs 'Christmas Blessings Sentiments', which I thought went perfect with the Flourish's Image. I added some crystals to the inside of the sentiment to really make the meaning pop. Hello and welcome to the Daydream Designs January Blog Hop. Our theme this month is 'Hearts'. To make my card, I used the Cupcake image from the set 'Sending You Love Color Digi Set'. This set is available pre-colored and in outline. I printed the image, put red glitter on the cherry, cut it out and popped it up on dimensionals. The sentiment is from the set 'Sending You Love Sentiment Set'. I used Spellbinder's Nestabilites for all the shapes and borders you see on the card, and added just a touch of ribbon for embellishment. Here is a list of our Blog Hop....be sure to leave a comment on everyone's blog, because a $20.00 Gift Certificate to DayDream Designs will be given to one random winner who commented on everyone's blog on the list. . The Blog Hop started at Diane's Blog, so if you came here first, you may want to go back there and start. Note: Edited on 1/ 25/12 to add that the contest is now over. : Your next stop on the hop is Beth! Hello! Today I have a Clean and Simple card to show you. I've been a long time admirer of Alice Wertz's cards ( she has a fabulous Clean and Simple style, and amazing coloring skills), and I really like her typical layouts of lots of white space with the main image in the corner and designer papers on top, that I decided this layout would work great with this large Daydream Designs image. To make my card even easier to create, I used the Colorized Version of the digi 'Snowbaby Love'. I just printed the image, and cut the paper so that the image ended up in the corner. Then I stamped a Crafty Sentiments sentiment in the other corner, added some Rustic Red Gingham Digi Paper to the top of the card with some stitching, and wa-la! I'm done. A sweet and easy card, done in minutes! Hello and welcome to another Digital Tuesday Challenge. This week's challenge is 'Flower Power'! Simply make a card or project with flowers and be sure to include at least one digital element. Our sponsor this week is Spesch Designer Stamps. To make my card, I used the Spesch Designer Stamp image "Meadow Girl Digital Stamp". I thought the image best represented the 'Flower Power' theme! I was digging through all my Spellbinder's Nestabilities to try and find a shape large enough to cut out the image I printed. I had no success, and did not want to print my image any smaller and lose all the pretty details, so I decided to use this old Cuttlebug Embossing Folder instead. I then created a 'window' card so the recipient can get a peek at the image, and then get the full image when they open the card. I thought the flowers on the embossing folder went perfect with the theme too. I put Stickles on both the embossing folder and the image. And here is the inside. I left enough space underneath the grass to sign a greeting/name. Hello and welcome to another Digital Tuesday Challenge. In honor of the New Year, our challenge this week is 'New Beginnings'. Simply make a card or project that has anything to do with being 'New', such as a new baby, new home, the new year, etc. Our Sponsor this week is Robyn's Fetish. To make my card, I used the Robyn's Fetish image 'Waking Up Birdie'. I thought the image could represent either a new home, or the Spring Season which is always a new beginning to me since everything is coming back to life. My sketch is from Mojo Monday (284) and the papers are from October Afternoon. Hello! Today I have a Valentine or a Romantic Card for any occasion that uses this week's Splitcoaststampers Sketch (SC417) and an image from Daydream Designs. The puppy image is from the set 'Snowbaby Love Color Digi Set'. The paper is Bo Bunny 'Crush'. I popped the puppies and heart up on dimensionals. The sentiment is from MFT and the hearts were cut Nesties! Hello! I know I'm late in my Christmas Post in comparison to all of you, but we just celebrated Christmas on Saturday because I had to work and the kids couldn't get home till after Christmas. Here are some pics and some stories behind them. First off, my old husband. He spends a lot of time doing this now: He use to be such a hard working man, now all he wants to do is sleep, read his bible, and watch religious programing. Can you believe he's two years YOUNGER than me? Don't you just love his 'post it note' gift tag? LOL! I do want you to know that I share this story with you not to bad-mouth my husband, but because so often this time of year we always see the smiling, happy faces and we forget that some Christmas's aren't wonderful because people are human and make mistakes. Our Christmas had some special memories, but also some hurts, but that's what love, forgiveness, and families are all about. Now onto some 'happy photos' and fun memories. Here is me smiling and holding Jordan's gift in our dining room. This is our tree in the family room. Unlike Jordan's post it note gift tag, Ashley was the opposite and spent the entire day beautifully wrapping gifts and making special tags. What a difference a boy and girl are. This is my son in law Jason displaying some socks he received. Here's the boy who saved Christmas displaying a Christmas sweater. Jordan's favorite gift from me was a pair of grey striped pants. One of Ashley and Jason's beautifully wrapped presents to me. I just loved the glittered reindeer on the bag. My gift to my husband. He is obsessed with bible prophecy so I bought him a couple of books on the topics. One thing I have done for my kids each year of their lives is to give them a tree ornament. My daughter is a professional singer, and when she was younger she played 'Dorothy' in 'The Wizard of Oz'. I found four Wizard of Oz ornaments: Dorothy, the Scarecrow, the Tin Man and the Lion that are made of wood and move. They are so cute and creative. I bought this pencil skirt for Ashley and although she loved it, it didn't look right on her full figured bottom, so I tried it on and my bottom half is built straight and narrow, so it looked great on me so I kept it and have since bought her something else. Jordan examining his chocolate Santa. And finally here is me wearing a beautiful scarf that Ashley and Jason bought me. It is extra special because it is part of a Christian Ministry where people from third world countries make/produce things and then they sell them in America to help support them. The scarf is so soft and luxurious and I especially love it because it has so much meaning behind it. Now your probably wondering what my husband gave me for Christmas. A neck pillow as a practical joke, a security safe so that I can pull my money out of the bank and keep it locked up since he thinks the world economy will crumble soon, and some knives for our kitchen. Yes ladies, he is in the doghouse, and it may be a long, long time before I let him back in. What did I say earlier in my post about love and forgiveness? Hmmmm, maybe, eventually. But not quite yet. We'll let him suffer awhile. Isn't it called Penitence? LOL!